All at the same time, I wanted to throttle the vet for being so dense, laugh hysterically, and send a prayer of thanks to the Universe for bringing Benny — now spelled “Bennie” — to Darren and me at the right time. We probably saved her life and the lives of her kittens, because there’s no way they would have all survived under that junky old porch. Most likely, Darren and I will keep one kitten in addition to Bennie and give the other two to a good friend. Exhibit B: The myriad details of wedding planning. Um, I’m getting married in just about four months. What?! Seems like just yesterday that I had a whole year. People are starting to ask about booking their travel plans and hotel rooms and transportation. Those are reasonable requests. It just means that Darren and I actually have to arrange these details instead of brainstorming dreamily about possibilities. There are hundreds of small actions that go into planning a 150-guest wedding, and I keep having to remind myself that this wedding is a stress-free zone. But come on, Jackson – no airport shuttle and hardly any public transportation? You’re not making this easy on me. Exhibit C: The ovarian cyst. Or whatever it is. I watch “Grey’s Anatomy,” and the only words I’ve heard that end in -oma are melanoma, lymphoma, and sarcoma. I’m no doctor, but I know that those are cancers. So I’d rather use the term “endometriosis,” even though that would threaten my fertility. If that ends up being the case, the doc would suggest that Darren and I try to have kids not too long after getting married. This is not currently our plan. 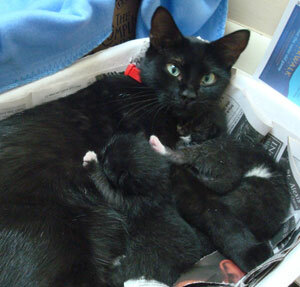 It’s been challenging enough to raise newborn kittens, and I’m not the one having to breastfeed them. We will all know more after the surgery. I’ve scheduled it for Thanksgiving week so I can take time to recover. Cross your fingers that a laparoscopy, a minimally invasive outpatient surgery, works so the doc doesn’t need to cut me open. On the upside, I’ll probably be lying around either way with more time to blog. You’ve got to keep on keepin’ on. Get on that pig and hold on tight. Silly as that line is, I’ve said it to myself repeatedly today, and it genuinely helps. I love how Baby Monkey falls off the pig in the middle of the video, but he runs after the pig and hops back on. Baby Monkey doesn’t quite know where that pig is going, but he trusts that it’s a journey worth taking. He trusts that everything will turn out all right in the end. Ah, the wisdom of Baby Monkey. Get on that pig and hold on tight. I’ll be thinking about you over the next few weeks! Cysts seem to be such a frequent issue that I’m sure it’s nothing major, but it’s still not fun to sit around and wait for answers. Let me know if you need anything. Thanks, Katie, I could use the love! A friend of mine had a cyst removed recently, so I’ll be asking her to walk me through the process. The doc seemed confident that it would all turn out OK.
Oh, Melia, I didn’t know about the cyst. How nerve-wrecking! Sending you many positive healing thoughts and hugs as well as an offer to take care of anything I can for you, just let me know! Aw, I appreciate that, Sara. It’s definitely rough not knowing what exactly is going on. I’m debating what will stress me out less: moving the surgery up and finding out sooner, or going ahead as planned and having a holiday week to recover, and not having to take off extra time from work. Thanks for the support! Hi, I saw your post while I was Googling for Grey’s Anatomy and sarcoma. I’m on the board of the Sarcoma Alliance. I just wanted to reassure you that “oma” is used for lots of benign tumors. For example, uterine fibroids are known as leiomyomas. So, please don’t let the “oma” part scare you. Good luck with everything you’ve got going! Hi Suzie, glad you found me through that keyword match! Thank you for the reassurance. You’re the first one to explain “-oma” to me. One upside of watching a lot of Grey’s is that I have a sense for how hospitals function — though I hope there’s less gossiping while the doctors operate!